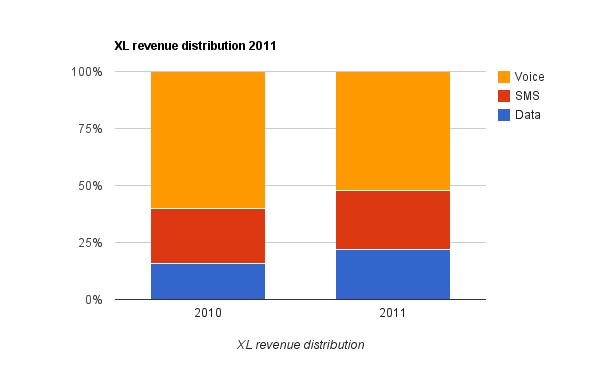 In the first 9 months of 2011, XL (one of the notable mobile phone operator – see my article on Indonesia wireless telecom overview) reported their mobile data revenue increased by 50% and represents 22% of total revenue while total mobile data traffic increased from 1.7 TB to 6.6 TB (288% increase in 1 year). Mobile data consumption is mostly driven by the availability of low cost 3G capable smart phone (such as Samsung Galaxy Y that retails around USD ~$100 un-subsidized). Smart phones enable a broad range of new use cases for non-connected apps such as games and a vast improvement in connected applications such as video streaming (Youtube is popular Indonesia), social networking (faster photo download and upload), and cloud related business application such as Google Docs and Apps. 3G UMTS/WCDMA network utilizes a completely different radio access network than 2G GSM/GPRS/EDGE network. 3G WCDMA radio interface can offer high speed mobile data connection up to 14.4 Mbps compared to 200 kbps for 2G GPRS/EDGE . To maintain backward compatibility with existing 2G service, operators must obtain new spectrum license and operate the 3G network on separate frequency range than their existing 2G service. Although most of the network equipments in the Core Network and Mobile Switching Center can be shared between 2G and 3G network, installation of new 3G BTS equipments (also called Node B) are required to offer 3G service. To ensure broadest service coverage for 3G subscribers, mobile phone operates both 2G and 3G radios simultaneously so it can switch between 2G BTS and 3G BTS depending on availability. XL is one of the operators that received the license to operate 3G networks at 2.1 GHz frequency range. XL is perceived to be the leading operator for high speed mobile data due to its intensive investment in Jakarta’s 3G network recently. They have 3900 Node B units installed in 2011 (~15% of their total combined 2G and 3G BTS). This represents a 60% increase from previous year. Their plan is to add 2000 additional Node B units by end of 2012 (another 50% increase). As voice reaches market saturation point, operators are relying on the demand explosion of data service to fuel growth. As more people realize the number of new use cases and applications that smart phone and mobile broadband offers, adoption is going to increase exponentially for the next 4-5 years. LTE will not be deployed for a while since operators are still in the capital expenditure cycles to upgrade to 3G and have not been able to realize return on those investments. However, as explained in XL’s financial report, they are migrating to the Single Radio Access Network (RAN) architecture to save operational cost and future-proof their LTE migration. Single RAN architecture allows a single BTS to support multiple radio access technologies (GSM/UMTS/LTE) that lowers overall energy requirements and upgradable to future new radio access technology. Other operator such as Telkomsel has also built their 3G networks since 2006 with Node B deployment that matches XL’s strength. Some CDMA-based fixed wireless operators (such as Bakrie Telecom and Smart Fren) were also given licenses and frequency spectrum to offer mobile data service. They want leverage their investment in the 2G CDMA network and market 3G data service (1x EVDO rev A – up to 3.1 Mbps download speed) with incremental investment.